Caleb is a registered architect and Senior Project Manager at DSK. 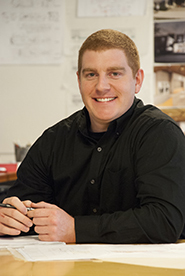 Caleb has extensive experience in translating design concepts to construction with his keen sense of craft and knowledge of sustainable systems and materials. Caleb has successfully worked on projects ranging from traditional New England homes to large scale, custom villas in the British Virgin Islands. He thrives on developing positive working relationships with clients, design consultants, and contractors resulting in project outcomes that exceed expectations. Caleb comes to DSK from Kao Design Group. He graduated from Norwich University, where he received his Master of Architecture degree, with a focus on early childhood education and sustainability. While at Norwich, he participated on the University’s 2013 Solar Decathlon team as the Clerk of the Works, leading a team of students in the design and construction of a solar house focused on affordability. Outside of the office, Caleb enjoys golfing and road and mountain biking all around New England.